Bacteria attach to tarter deposits that form on teeth. If left untreated, the bacteria can cause an infection in the gums. A gum infection that is left untreated can lead to pain, bad breath, tooth mobility and eventually tooth loss. At Parma Ridge Family Dental we routinely screen our patients for any evidence of this process beginning to take place. If any gum infection, known as periodontal disease, should start to develop we will recommend gum therapy be performed. 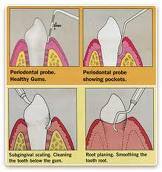 Gum therapy, also known as scaling and root planning is done with local anesthetic to ensure your comfort. In most cases, this scaling and root planning procedure, along with diligent home care and regular visits to our office will eliminate the gum infection.